Garry when I started then from seed I just used potting soil and water. I put then outside for about a week during the day to harden them off but when I planted them they dampened off. The next morning they where white and dead. A couple of friends told me the problem was you need to water then with fertlizer after they get their first real leaves. The best kind being manure tea. I will try that this year. One of the people I talked to always has the most amazing pepper and tomatoes you have ever seen. 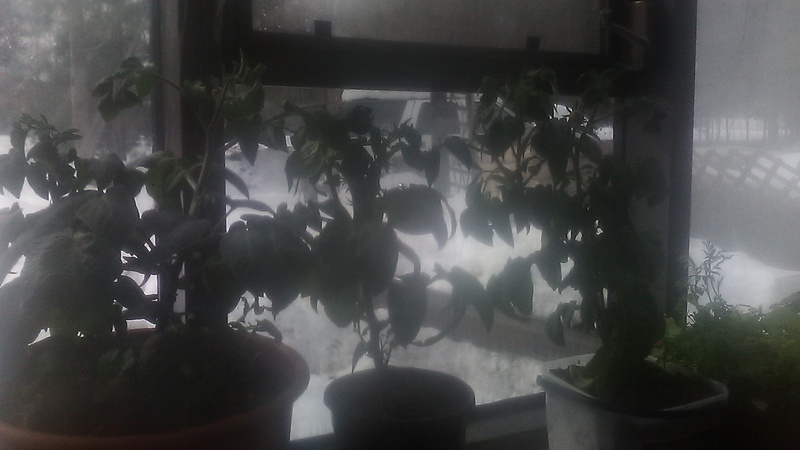 I have had great luck with tomatoes I buy as plants and last summer I raised amazing peppers. So that is my plan this year get the seeds started then feed them the tea so they grow strong. I start all my plants under fluorescent lights. I have a 4 bulb cool white shop light and an economy 4ft twin beside it with grow bulbs, in an adjustable stand. A good potting soil mix with blended fertilizer is good to start, but after a while additional nutrients help. Once the plants reach a certain stage of maturity damping off isn’t much of an issue. As you are doing, a week of hardening off outdoors is a good practice prior to planting. I make an insecticidal tea for spider mites and other bugs. I soak tobacco and buffalo sage in water, then add a small amount of dish soap (to break down surface tension on the pests). All surfaces of the plant have to be sprayed top and bottom, plus the soil, but it’s effective. Keep in fridge for future use. My theory is that the more variety of bug toxic compounds, the greater the effect, due to synergy. Just examine the local plant communities for aromatics that bugs never bother, there’s probably toxins there. as I have killed some plants with too strong a mix. One is for sure. Our wild leaks do nothing of these. Althugh they look identical to yours, they dont eaven produce seed and grow from the same bulb year after year. Lucky you, Kristijan, it will be about 2 months or more before I taste these again. What is the latitude where you live? I’m trying to find out what your leeks are that multiply by division. I just did some further reading and perhaps these leeks do set seeds and divide like yours as well. I never had a reason to research this before, but I will keep a close eye on the growth, check this out and let you know. Hmm not sure about 45° north l think. Well not quite true, our leals do produce white flours and most likely seeds, but mainly just devide to reproduct. Thus, they usualy grow in tight bundles. Nice to harvest. Hold a bundle, cut the stamp and you have https://www.google.si/search?redir_esc=&client=ms-android-samsung&hl=sl-SI&safe=images&q=čemaž&source=android-browser-type&qsubts=1522501671797 a half a pound of leaves in your hand. I looked it up, I think Kristijan is on the 46th latitude. I’m on the 47th. Thanks, Bill, I’m in the middle @ 45 degrees North. I doon’t know if we have your wild leeks, but our elephant garlic is actually a leek. We have those all winter. They come along in the fall and grow all winter. Die back nd divide about June I guess. Do you have that up north? We’ve been anxious for a little rain as it’s time to start getting lots of oyster mushrooms off the poplar and willow. We had a little run of them back in Feb.
Well, the snow is just about gone and has revealed what looks like the real answer to what I have growing here. In all these years, I can’t believe I never paid more attention to the growing habit of these leeks. Low and behold I found these shoots from the leeks. They are obviously from last year. We well may have the same dividing leeks after all, as I see this new growth sprout out of the earth next to the seed pods. I’ll dig up a clump in the next week so see if they are in fact dividing clumps. 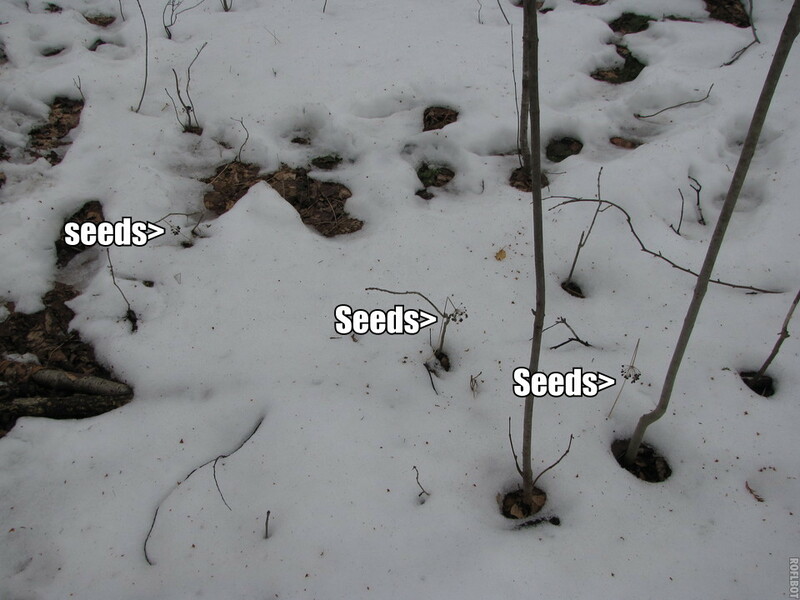 I’ll also watch for germinating seeds. I will take some seeds to the house and try to germinate them as well and start some beds closer to my house in a shadier spot. Good evening everybody, hope you all are OK. My wife has a question: …she wants to know if anyone of the group has had any experience harvesting and preparing FERN SPROUTS (also named BRACKEN). We have TONS of it in this mountain, and we heard of someone in New Zeland who had experience with them. I haven´t found anything in the web. As I understand it, some bracken ferns can contain neuro toxins. Here and in eastern north America ostrich fern is the preferred food variety. I would carefully scan the literature before consuming other kinds of fern sprouts. The New Zealand ferns are genetically distinct. South America may also have distinct varieties. I understand the Maori used to eat the starchy roots of ferns. Local indigenous practice should also be a good guide. I have eaten the “fiddle heads” from ostrich ferns for at least the last 40 years. In very early spring the fern clumps grow a tightly curled coil that resembles a fiddle head. These coils eventually unwind to the mature fern. These coiled fiddle heads should be picked and eaten before they uncoil. Pick off the fine covering, wash, parboil slightly and saute in butter for a few minutes. Yummy! I have never eaten a mature fern plant and strongly advise folks not to eat them either, as they do contain toxins. Enjoy, they taste great for a wild food. I will post some pics of them in various stages in a few weeks, meanwhile here’s my fiddle head patch. That looks like pics of ostrich ferns. We have to be careful using common names, as they will vary by region. thank you all for the response. What I´ll do is take pictures today and post them so you can see the variety we have the most invadeing all the farm. Yes, they are ostrich ferns not bracken as I stated (and edited).